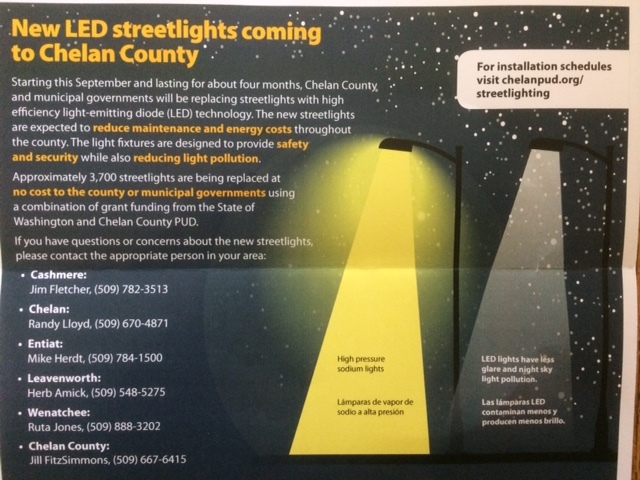 Just got this in the mail today from the public utility district. For more information....follow this link. My house is up Burch Mountain so hopefully that will show great inprovement. Now if we can just fix all the wall-pacs on the commercial buildings in town!! Edited by vsteblina, 30 August 2018 - 03:23 PM. WOW!! You are indeed blessed to live where you do. Perhaps that will cause other places around the country to go to LED. WE will all benefit from this in due time. It is something how loud the dollar speaks....If folks will only listen. Thank you for giving to us that encouraging news!!! I thought LED was harder to block than sodium due to its broad spectrum output. No? Very nice! They have started to change the drop lens style lights from my town to the LED style, which definitely reduces overhead glare in the town in general, but it hasn't made any difference at all in my backyard lighting situation. If anything the new ones are even brighter even if they don't emit light into the atmosphere, but in the long term it's nice that the city in general should be a bit darker! ............... It is something how loud the dollar speaks....If folks will only listen. Thank you for giving to us that encouraging news!!! In the case, the dollar speaks in different ways. The Wenatchee Valley has the LOWEST electric rates in the US. Douglas County rates are .023 cents per kilo-watt hour, while Chelan County rates are .027 cents. Look up your electric bill and multiple the kilowatt hours by .023 or .027 and see what your electric bill would be if you moved to the Wenatchee Valley. The local Public Utility Districts do sell the surplus power to western Washington, Oregon, and California. Currently, the local rates are below the cost of production due to sales outside the county. So any conservation practices that save energy locally make more energy available for sale outside the county. Thereby, keeping local rates low. I have to give the PUD credit. They could have just gone ahead with the conservation measures while NOT paying attention to the light pollution aspect. The fact they mention it in the public flyer and are cooperating with the National Park Service group in actually measuring light pollution bodes well for the future. Click on the link for additional information on the program. The astronomical details are there. Edited by vsteblina, 30 August 2018 - 04:00 PM. I'd wait to celebrate until the new system is completely in operation. Reports are very mixed about any improvement that the new LED fixtures are providing. Most agree that they are definitely brighter than the older heads even if they are better shielded. I honestly haven't read a single report of a marked improvement in actual sky darkness taking place any where LEDs have been installed. And, Petert913, the illumination from LEDs can be very difficult to block, with some not responding at all to the usual blocking filters because of their typically broad spectrum of light emitted, not just the few specific lines as with the old fixtures. Our town converted and the light under the lamps and anywhere near the lamps is distinctly brighter. When you look at the lights at higher and lower elevations that stand out as pools of bright white. The LED lamps produce a full spectrum with considerable blue, light that is certainly brighter than the old HPS and mercury lamps and the new lights have better distribution than the old cobra heads. Each street lamp area is now a very distinct with patch, or seen from a distance a cone with more bounce light that from the older lamps. LEDs do reduce the utility of filters, no question. The town owns the lights and pays the utility to maintain them. The conversion cost came from the lighting assessment district reserves, which now have to be replenished. The streetlight bill did not go down one centavo, or even a plug nickel. It will take years to recoup the conversion cost. We ended up with the bright white LED fixtures because one council member just did not like the colors of the older lights and another wanted them to be bright and white for safety. No evaluation or study was done by the town, unlike other cities in the general area that held open competitions, and had demonstrations lights installed for public input. The public in that town asked for and got warmer lights, less bright lights and lights that did not illuminate front and side yards. The town was converting from LPS (originally installed to protect Lick Observatory) and it turned out that many residents did not think that whiter and brighter was better. So if you get the chance if there is a chance you might want to find out more about the lamps and the fixtures that are coming. There might be a need for and a chance to make a useful change. Useful for everyone, not just astronomy observers. I think you guys are WAY to negative. We did have a car dealer replace his lights with LED's. From my house on the hill four miles away it was very easy to pick out the dealership. Once the LED's went in....you cannot tell where his operation is located. It was that significant. Second...governments can promise you lots of things. However, promises without any action of follow-up likely means that it will not be done. In this case, the PUD raised the issue of light pollution. They also contracted with the NPS to monitor and evaluate the effectiveness of the new lights on light pollution. I think there will be follow through simply because they will be monitoring the changes and they publically commited to it. I will be interesting to see the "public" response to the change. Since the entire changeover will be completed in less than a month it will be a dramatic change almost overnight. Vladimir, in the instance of car dealership you cite, if you were elevated above its level by virtue of living on a hill yet were disturbed by its lights, then the problem was glare, not reflected light illuminating the sky. Overall, the latter is the biggest problem. If the new fixtures are simply shielded where the old ones were not, but the new lights have a greater illumination output, it could either amount to a wash, or even a net increase in the light pollution. While one must wait to see and to evaluate the actual impact of the new lighting system as a whole before assessing whether it is a gain , or a loss, my guess is that once the area's trees loose their leaves that you are going to be disappointed with what you see. Whether or not the new lights produce less sky-glow will depend in large part how much light they emit in the blue part of the spectrum. I'd call and ask what the CCT of the lights will be. Hopefully under 3000K. Unfortunately, most streetlights are 4000K or 5000K. The financial incentive to reduce power consumption is encouraging from the standpoint of using lights with a lower lumin output. But since higher temperature LEDs are more efficient, it's also an incentive to use 5000K or higher CCT lights. Edited by earlyriser, 02 September 2018 - 07:59 AM. The streetlights will be 3000K. Click on the link...there is more information there. Includes the picture of the Wenatchee light dome from just north of town. I think the change will be significant for streetlights. Now the issue will be the wall-pacs and commercial lighting. Oops, didn't see the link. I really like that they are measuring before and after sky glow. I wish Duke Energy would take light pollution this seriously. National Park Service article on the new lighting in Wenatchee. The streetlight replacement project has started. The one arterial that I have driven at night looks good. The have been replacing the cobra lights as well as the shielded with LED's. The LED's appear brighter when you look at them, however, when you look at the street the light intensity is almost exactly the same as with the previous lights. That might mute complaints since the lights appear brighter. The one surprise was the little "wings" on the edge of the LED lights. They do spread the light down, but also sideways along the roadway. From a driving perspective almost the entire road is illuminated rather than having a puddle of light underneath each streetlight. The cut-off is really good. If I owned a house along a lighted street I would be pleased....hardly any light spilling over onto the homes. The conversion is going really quickly. Last night, I saw that one street had the new LED's on one side and the cobra light fixtures on the other side of the street. I was going to take a picture tonight, but by this afternoon the entire street was converted to LED's. It will be interesting to see what the final impact will be on light pollution. I see a lot of "orange" streetlights from my house....I assume that they are the cobra light fixtures. Those should no longer be visible and should significantly darken the hillsides and my house. I don't know how much glow the new LED's will contribute upward, but the sideways glow should be reduced. I sit four miles and three hundred feet above downtown Wenatchee. The conversion should be completed this month. At this point, my guess is slightly darker skies. The conversion will really bring out how bad the wall packs and commercial lighting is in town when it comes to light trespass and light pollution. That will be a tougher issue to address particularly for the community. Edited by vsteblina, 05 December 2018 - 11:40 PM. Most of our area started the switch last year...large sections are now converted. Locally though, they didn't change the fixtures. Downtown victoria still has big round upward pointing decorative lights along the main drag, and downtown Sidney has frosted fixtures that are shielded at the top but still emit a lot of sideways light. So is the light pollution worst or better in Victoria?? Are they brighter than the previous lights and do you know what the color temperature is?? Around the city, tough to say without doing some hard measurements. Victoria isn't very big, but it is tough to get away from it unless you go up the Island or the peninsula. The peninsula is actually mostly UNDER-lit as far as street lights are concerned. Many stretches of road have no lighting at all due to the semi-rural nature of the municipalities here. Bill Weir might be a better person to ask, since as far as I know he has actually been pretty instrumental in lighting regs around here. The fact that the city seemed aware of light pollution is a good thing, and lends hope they took that into consideration when speccing the fixtures. Out small city switched over to LED streetlights last year and while they are full cut-off fixtures I've noticed that improvement is offset by a couple negatives. 1. More atmospheric scatter. The whiter light with more blue scatters more. 2. From a driver's viewpoint LED streetlights have more glare once you enter the light cone. The fact that the light is emanated from small discrete and intense point sources is more dazzling in my peripheral vision than the diffuse light from a Cobra fixture lens. Having worked for a public institution that was slowly converting to LED fixtures I can say there's a lot of pressure to make things brighter for "safety and security" reasons. Hopefully your city is resistant to the brighter is better pressure. Our institution also has been on an "energy conservation" kick and the idea LED lighting saves money was one driver for making the conversion, but I also frequently have heard people involved in the process say things like: "Now we can afford to add more lighting to dark areas or increase lighting level in existing areas." In a nutshell, cheaper light encourages more light. That said, I hope your the awareness of light pollution means your city is willing to do things long term to mitigate the effects of outdoor lighting. If you are seeing positive results, that's awesome and it might not hurt to send a letter of appreciation to city officials. Another thing I noticed working for a public entity. The people in charge rarely hear from the satisfied public, but they sure do hear from the unhappy ones. I've seen negative changes first hand made literally because of the complaint from one person especially, if they use the key words hazzard, or unsafe. Here is a current photo.....the lights on the west end of Wenatchee have started the conversion process. On the right side of the photo you can see the bridge crossing the Wenatchee River and the Wal-Mart store parking lot. Wal-Mart has been there for almost 20 years, but they had to meet full shielding standards. As others have mentioned it is the shielding that is important. It appears that the LED's will darken the sky glow somewhat, but it will really make obvious the lighting of wall pacs as well as the commercial lighting in town. This is exactly my experience with these lights in my hometown! Edited by Uranotopia, 23 January 2019 - 05:11 AM. We shall see. The pictures are taken from my observatory. If you look at my picture on the far left side of the picture....there is a street heading "due south" The middle portion of the street has been converted to LED's. I drove a different route in town today...and the LED conversion continues. On the right side the conversion has continued. There is no difference between the left and right sides of in population density, but the right side now looks darker. I have been focused on the main streets which are on the lower part of the picture. Those have yet to be changed out. The LED's are NO BRIGHTER than current street lights. I do know that the city of Seattle has increased the brightness of their LED's, but that is a city that quite frankly doesn't give a rip about the night sky. I understand the filtering issues. I am really looking forward to conversion on the three main streets since that is where the unshielded lights are located. Are you guys located in "flatlands". I am looking DOWN on the city so the effects of shielding are much more dramatic. Edited by vsteblina, 23 January 2019 - 08:46 PM. Keep taking pictures from the same place so we can see the changes. Update.....the conversion process is almost complete. My sky readings were in the neighborhood of 20.29 prior to the conversion and now (with a couple of samples) are running in the 20.49 neighborhood. So it appears the sky is slightly darker. Only a couple of samples since the conversion. Not as much as I hoped, particularly since Wenatchee is growing so fast that the outside lights in the local neighborhood are affecting the sky. In five years, my neighbors went from being upstanding rattlesnakes, and other critters to "urban refugees" from Seattle that are terribly afraid of darkness!! The county does not put up streetlights. I also lost my pictures prior to the conversion!! The unshielded lights have been removed and the replacement LED's are totally invisible from my house looking down into town. So it looks much darker, BUT the sky meter readings were a disappointment. In the end, I might have just moved back five years prior to all the development. Oh well, better than nothing. A friend with an observatory ten miles out of Wenatchee thinks his sky is darker to the west. I haven't been up to my cabin 10 miles west of Wenatchee to see the effect on the eastern sky. Hopefully, NPS will be back into town later this month and the PUD will publish their findings. For those that forgot about it here is the original story on the NPS monitoring. Outstanding. Some of the people who responded to this thread are pretty unaware of what is occurring and clearly have not spoken with the good folks at the IDA or others who have had success. I've seen negative changes first hand made literally because of the complaint from one person especially, if they use the key words hazzard, or unsafe. That sounds like an avenue of attack against badly aimed and overly bright lights that produce glare.